Sample of an iron meteorite, with one cent coin for size comparison. The author at Dundee Science Centre holding a sample of the Campo del Cielo meteorite, which fell in Argentina. An iron meteorite is a meteorite composed mainly of iron (Fe) and nickel (Ni) in the form of two nickel-iron alloys, kamacite and taenite. Iron meteorites are easy for even a layperson to tell apart from ordinary Earth rocks because of their metallic appearance and high density. They also tend to be bigger than either stony meteorites or stony-iron meteorites, because they usually survive passage through the atmosphere intact and suffer much less from the effects of ablation. All known iron meteorites have a combined mass of more than 500 tons – about 86% of the mass of all known meteorites. Yet they are quite rare, accounting for about one in 20 of observed falls. Kamacite is the commoner of the two nickel-iron alloys found in iron meteorites. It contains 4 to 7.5% nickel, and forms large crystals that appear like broad bands or beam-like structures on the etched surface of a meteorite. Its name comes for the Greek word for "beam." 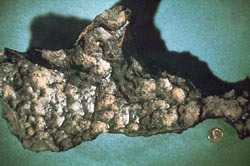 Taenite is the less common of the two nickel-iron alloys found in iron meteorites. Yt contains 27 to 65% nickel, and forms small crystals that appear as highly reflecting thin ribbons on the etched surface of a meteorite. Its name comes for the Greek word for "ribbon." Two ways have been devised to classify iron meteorites. The older, structural method is based on characteristic crystalline features that show up when the meteorites are sectioned, etched, and polished. Octahedrites, the commonest type of iron, with less than 6% by weight of nickel, reveal a characteristic Widmanstätten pattern that results from lamellae (fine sheets) of kamacite intergrown with nickel-rich phases. The width of the kamacite lamellae allows classification into 5 structural groups: the coarsest, coarse, medium, fine and finest octahedrites. Plessitic octahedrites are transitional between octahedrites and ataxites. Ataxites are nickel-rich (> 20% nickel), and are mainly taenite. Hexahedrites contain less than 6% nickel and are comprised of kamacite only; both hexahedrites and ataxites lack a classic Widmanstätten pattern. The newer chemical method of classifying iron meteorites involves measuring the amounts of trace elements such as germanium, gallium, or iridium present. The concentrations of these trace elements are then plotted against the overall nickel content on logarithmic scales. This technique has enabled 13 distinct groups, labeled by Roman numbers and letters, such as "IIIAB", to be identified. The members of each chemical group are thought to share a common origin on the same parent body. 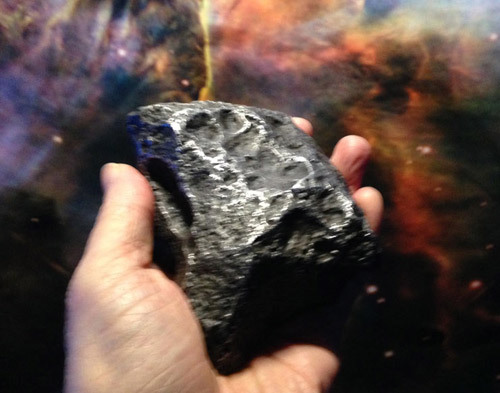 Iron meteorites come mostly from the cores of small differentiated asteroids that were broken apart by cataclysmic impacts shortly after their formation.